Consultation – Conduct an initial counseling session to determine your specific objectives, needs and wants. Financing – Provide mortgage qualification assistance, if appropriate. Providing You With all Listings Available on the MLS – Conduct an ongoing, timely search of property availability on the Real Estate Board Multiple Listing Service. Viewings – Schedule appointments and accompany you on all property viewings. Advice – Use RE/MAX Coast and Country’s experience and knowledge to point out the pros and cons of each property selected for viewing. Current Market Analysis – Complete a professional comparative market analysis on any home selected for purchase that will assist you in the offer negotiation process. Offer Preparation – Prepare the Offer to Purchase with your best interest in mind. Negotiations – Provide professional representation for you in negotiating with the Seller and the Seller’s agent. Organize – Schedule appointments to provide access to the property for inspectors, appraisals, painters, gardeners, etc. On Call For Any Questions – RE/MAX Coast and Country makes themselves available for your questions and concerns. Contact 541-412-9535 or 541-40-REMAX (Brookings office) and 541-412-3000 or 541-69-REMAX (Harbor office), available 7 days a week. Determine what you want – This is the time to consider where you would like to live and what type of home you envision yourself in. Take into account the size of home you need for your family, the type of home, the commute to work, the importance of schools and all amenities. Consider the neighborhood you would like to live in, and whether you prefer newer or older homes? All of these answers will help you in finding your new home. Consult your Mortgage Specialist – See what you can realistically afford. Get pre-approved to save yourself time later. RE/MAX Coast and Country can provide a list of referrals and contacts if you need help getting started. 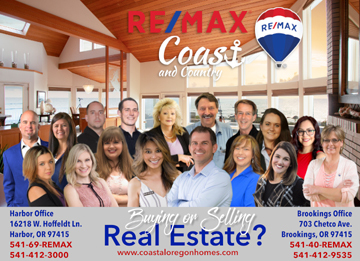 Consult with RE/MAX Coast and Country – Now that you have a list of what you want and you know what you can afford, it’s time to consult RE/MAX Coast and Country. They will provide you with a detailed list of homes that meet your criteria. View Homes – After reviewing all the current listings, you need to go out and see the homes that pique your interest. Take a feature sheet of each home meeting your criteria and make notes about the home, after seeing one or two homes it’s a great reference to remember your likes and dislikes with each home you viewed. It is also important for you to give RE/MAX Coast and Country feedback about each home, letting them know what you like, dislike and why. This will assist them in selecting future homes for you to view. Closing Date – When is it most convenient for your family to Move? After you have negotiated these points, RE/MAX Coast and Country will present your offer. The Seller can accept, reject it, or counter. If the offer is countered, then you must consider whether you want to sign back the offer and proceed with the process or if you want to end the process and look for another home. RE/MAX Coast and Country will guide you through this process, but the decision will always be yours. Satisfy Conditions – If you decide to proceed, and your offer has conditions, your next step is to satisfy all conditions. It is important that you satisfy all conditions before their deadlines. Move into your New Home – As soon as you have your moving date, contact movers for quotes. Approximately one month before closing contact your bank, the post office, your cable company, Internet provider, telephone company, newspaper, utilities, credit card companies, OHIP, and the MTO about your move and make appointments for new installation if required at your new home.